Always wanted to take a real African safari but never had the time or money to do it? Safari parks are the next best thing and give people of all ages the chance to see African wildlife up close with no bars or cages to ruin the views. Safari park are larger than zoos, though usually cover a very small area compared to game reserves and national parks in Africa which can be up to 85,000km sq. The biggest draws of a safari park is that animals roam free in large enclosures which you can take a safari drive through – either on your own or with a guide. 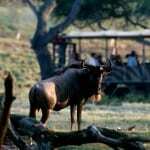 There are also options for walking safaris in some safari parks. In this piece we’ve picked out the top safari parks in the world for a traditional African safari experience. Whilst they’ll never be as immersive as a real African safari, a day or overnight trip to a great safari park might at least get you in the mood to save up for the real thing! Whilst Africa will always be the home of the safari drive, the first drive-through safari park outside of Africa opened in 1966 at Longleat as a 100 acre reserve for 50 lions. Set within the grounds of the Longleat House stately home, the safari park has grown and is now home to dozens of African animal species. There’s still a large pride of lions, now complemented by cheetah, rhino, elephant, giraffe, zebra and a plethora of African monkeys. Whilst you can choose to drive yourself around a number of large enclosures, Longleat also offer a range of VIP guided tours – from a couple of hours to a full day. 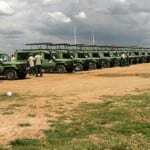 These take the form of being driven around the safari park by an expert guide in one of the specialised safari vehicles. Steer clear of the rhino! The American-run “West Midland Safari and Leisure Park” has been in operation since 1973. Here you can drive yourself around the “Africa Reserve”, a large open area which is home to a group of Southern white rhinos, along with plenty of other savannah grazers including giraffe, zebra, waterbuck, eland and the swamp-dwelling red lechwe. Other enclosures containing fabulous wildlife you can drive through include cheetahs, a large pack of the very endangered African wild dog, African elephants, and of course the mighty white lion. If you think that there’s more to safari parks than simulated African safaris, the West Midlands Safari Park also offers a tiger reserve and an “Asian Reserve”, housing the rare one horned rhino alongside a wide range of sub-continental antelopes and buffalo. Set in the middle of California’s wine country, Safari West styles itself as a “Sonoma Serengeti” with savannah-style landscape. 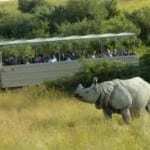 The 400 acre safari park has 800 free roaming animals from herds of kuddu, zebra, antelope, buffalo and gazelle, to huge African rhinos and giraffe. Safari West offer “the ultimate private safari” excursions where a private group of up to 10 people is taken on an exclusive safari ride with a guide, and like some true luxury African safaris you can add wine, cheese and chocolate to your safari should you need an appetitive whilst game viewing. 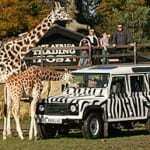 The private safari is essentially a 3 hour guide-led drive through the safari park in an authentic safari vehicle. For a complete safari experience you can spend a night onsite with views over a lake or nestled in the woods with a true bushveld feel. The accommodation is in authentic African safari tents with a luxury twist, built on wooden platforms with large decking areas for lounging and taking in the views. If tents aren’t your idea of luxury then cottages are available too. Wild Side safari park in Ohio offers a fairly authentic safari experience. You can buy a “Safari Transport Pass” to get shuttled around a selection of enclosures (Lake Trail, Mid-Sized Carnivores, Wetland, Pasture and Outpost), each with a selection of impressive African wildlife. The game highlights are the giraffe, rhino, zebra, cheetah and African wild dog. In the “Pasture” area dozens of grazing species of African animals roam free, whilst the predators are kept separately for obvious reasons! A guided open vehicle safari gets you immersed in the rolling countryside and gives you the best opportunity to view all of the game on offer. 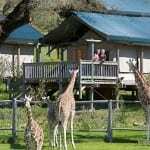 Unlike most other safari parks Wild Side offers a selection of safari-style lodges. This gives Wild Side the benefit of having sundowners on your balcony whilst game viewing, then spending the night onsite, listening to the sounds of Africa…in the US mid-west! Disney don’t bill their Wildlife Kingdom as a safari park, but rather the largest animal-themed park in the world. And with 250 species made up of more than 1,700 animals roaming 2km sq they may well be right. The entire park is split into seven areas, one of which is “Africa” themed. One adrenalin pumping safari offering in this area is the “Wild Trek Africa” experience – a privately guided expedition which features close encounters with Nile crocodiles and huge hippos whilst hanging from a harness 10 feet in the air! If that’s a bit too hair-raising you can always take a more traditional open-sided safari vehicle for a game ride through acres of replica savanna, rivers and rocky hills. Expect to see elephant, giraffe, pelican, cheetah, lion, oryx, black and white rhino, and just about any other wildlife you’d hope to spot in Africa. 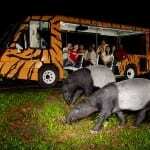 The Singapore night safari is rightly a world-renowned safari experience. The safari park has eight geographical regions – linked by three walking trails and a tram route – to observe the primarily nocturnal animals from around the world. The reserve has an “Equatorial Africa” section of the park, which fits nicely with Singapore’s warm and moist climate throughout the year. Ample sunlight and rain support luxuriant tropical forests. In this part of the park you can expect to see Cape giraffe, serval and bongo – the largest of Africa’s forest antelopes. 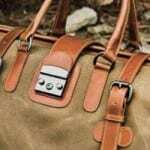 To get away from the crowds and have a more personalised safari experience you can take a guide and small safari buggy through the park rather than the tram, and combine this with a choice of safari and dinner options. 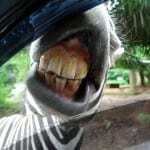 Say hello to the zebra! Taman Safari Indonesia are safari parks in East Java, West Java and Bali, known as Taman Safari I, II and III respectively. Taman Safari I is the most popular and largest of the three safari parks and has over 2,500 animals, the majority of which are Indonesian and include tigers, orangutans, elephants, sun bears and komodo dragons. 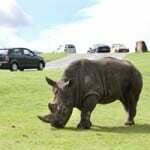 It’s a drive-through safari park where you can get very close to the wildlife. Those on the hunt for an authentic African safari experience won’t be disappointed, and can keep an eye out for the resident hippo, zebra, cheetah and giraffe. There are both camping and bungalows available to those who’d like to stay in the safari park overnight to soak up the atmosphere. Taman Safari III is also known as Bali Safari and Marine Park – more of a theme park than a safari park, but highly popular with tourists none-the-less. What’s your take on safari parks – decent African safari alternative, or little more than glorified zoos? Get involved in the comments below and let us know your thoughts on safari parks.